This month’s Under10 spotlight will be familiar to faculty, staff, and returning students—it’s Viga, a campus favorite for event catering. 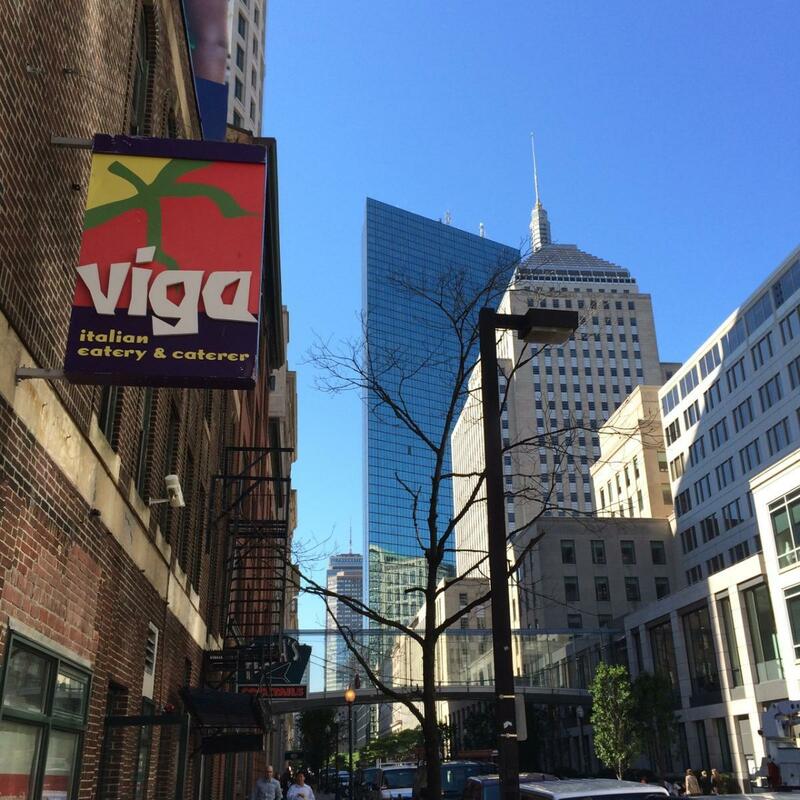 While you’ll probably enjoy their sandwiches or pizza on-campus at some point this year, I thought it’d be nice to highlight their takeout options, as Viga is a regular in my lunch spot rotation. There are four locations in the city and both the Stuart Street and Devonshire Street locations are within a 10 minute walk of campus. I have an arbitrary preference for the Stuart Street one, but there’s no difference in their offerings. 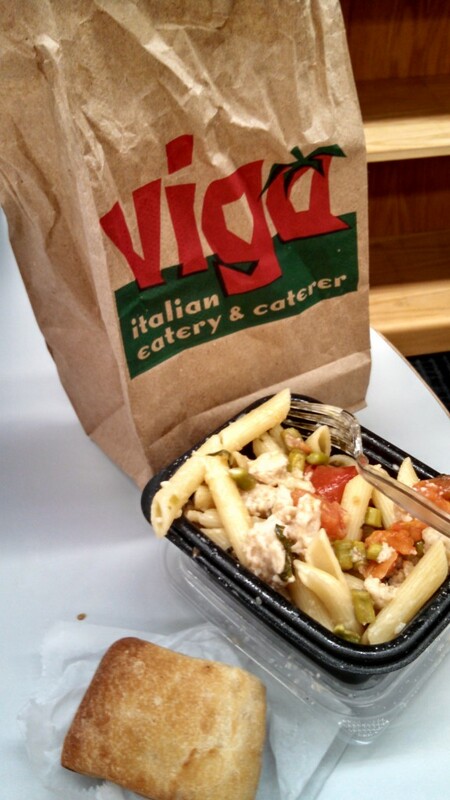 Viga’s menu consists of standard Italian takeout joint fare: calzones, pasta, pizza, salads, sandwiches, and wraps. They have a set rotation of daily specials for calzones, pizza, and pasta, which adds nice variety to their regular options. You can find these on their website. With the exception of whole pizzas, everything is under $8.00. My go-to is their pasta, which is particularly cheering on a cold day. The baked ziti is reliably good; for specials, I like the Penne Badia (Tuesday) and the Pollo Tuscano (Friday). A small regular pasta runs from $3.39-$4.49 and small special pastas are $4.49 or $6.19. All pastas come with a fresh homemade roll, which makes it an even better deal. For $6.99 you can get a small pasta ($4.49 or under), a small salad, a soda, and a roll. Their other options are equally wallet-friendly: sandwiches run from $6-$8, pizza slices around $3, and calzones around $5. At the checkout counter, there are a number of tempting baked goods. Their molasses ginger cookie is outstanding, a perfect balance of crispy and chewy, but I don’t think you could go wrong with any of their desserts. 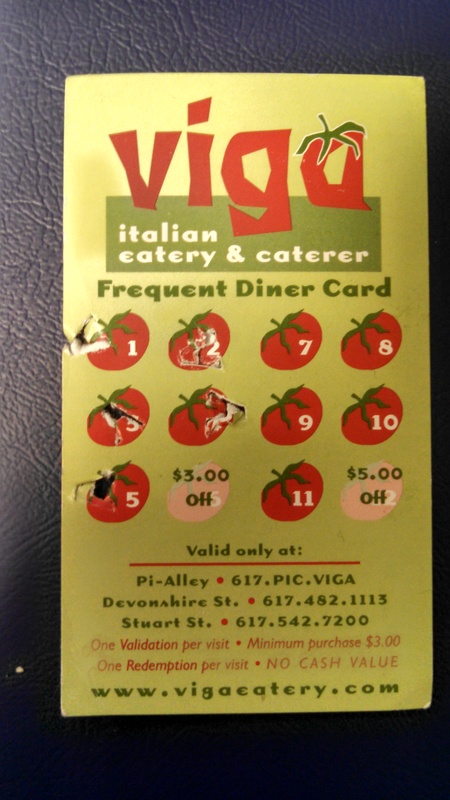 When you pay, be sure to ask for their frequent diner card. On your 6thvisit, you’ll get $3.00 off and on your 12th you’ll get $5.00 off. It’s one of the better visitor rewards programs I’ve seen. The restaurants are usually packed between noon and 1pm—people sometimes spill out onto the sidewalk—but the line always moves fast. There are different stations for each type of food, so things progress easily once everyone has sorted themselves out. The Devonshire Street location has some seating, but the Stuart Street one does not. 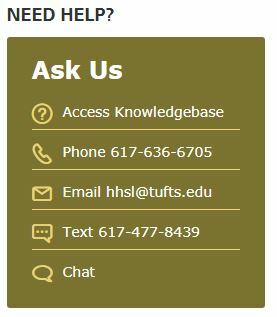 If you visit the latter and don’t want to head back to campus, enjoy the weather while it’s still nice in the Public Garden or on the Common. Viga. 304 Stuart Street, Boston, MA. Monday-Friday 11am-3pm | 291 Devonshire Street, Boston, MA. Monday-Friday 11am-3pm. Both locations accept cash, credit cards, and LevelUp. 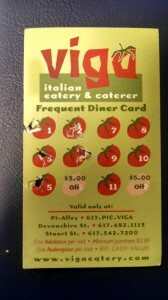 Do you have a favorite day-of-the-week special at Viga? Do you want to debate me that the Devonshire Street location is better? Write to us! This month’s Under10 Spotlight is a double feature! A combination of an adventurous mood (not preparing lunch in the evening) and oversleeping on two days led me to two spots: Momogoose, a food truck, and its sister restaurant Saté. Both are located near South Station and offer the same menu. 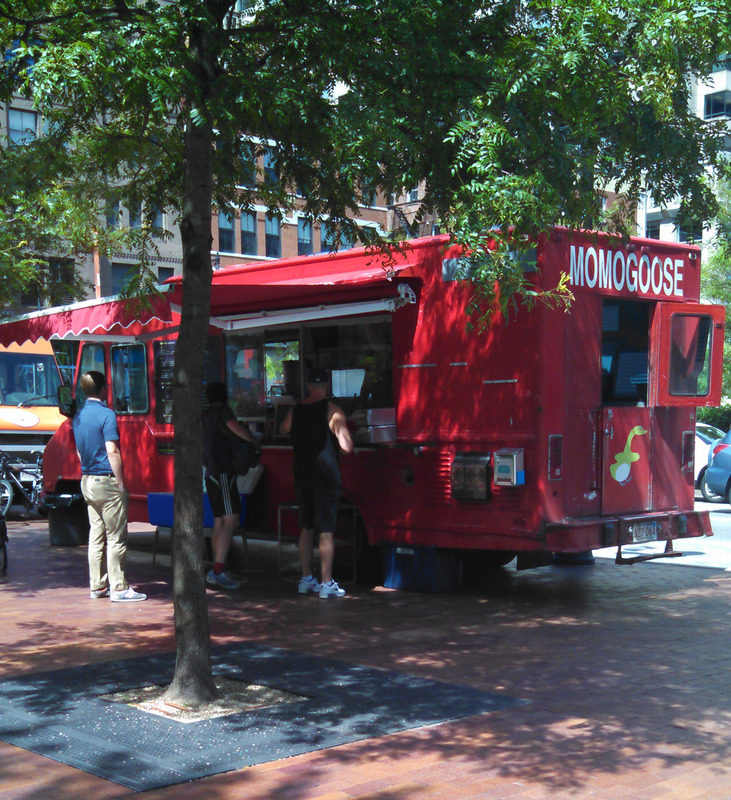 Momogoose is at the intersection of Congress St and the Greenway, and Saté is in the Nonprofit Center on South St (right next to Al’s). I’ve wanted to get lunch from one of the Dewey Square food trucks for months, but they are always dauntingly busy. The lines to order wind around the plaza and the group of people waiting for their orders to be ready is massive. I’ve noticed, though, that if you travel just a block further to where Congress St intersects the Greenway, the food trucks there have much shorter lines. 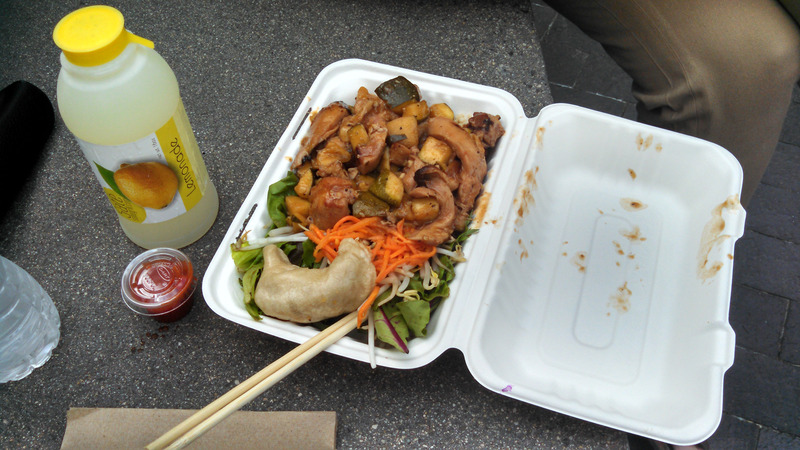 I decided to head to Momogoose for my first food truck post. 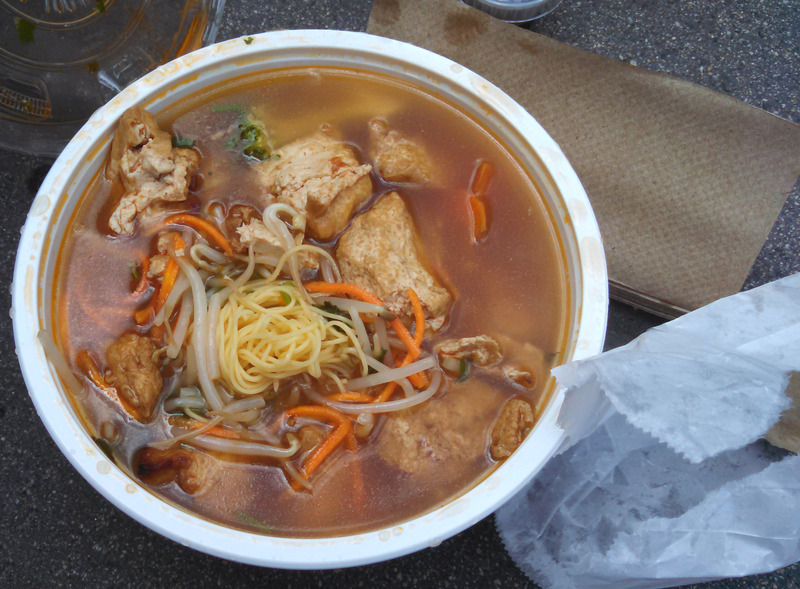 Momogoose offers ramen, pho, banh mi, and create-your-own rice or noodle bowls, with a variety of protein choices. Each dish is $6 and for $8 you can get a main dish, a beverage, and dumpling or crispy roll. I ordered ramen with beef, a crispy roll, and a lemonade (which cost an extra dollar but was worth it). 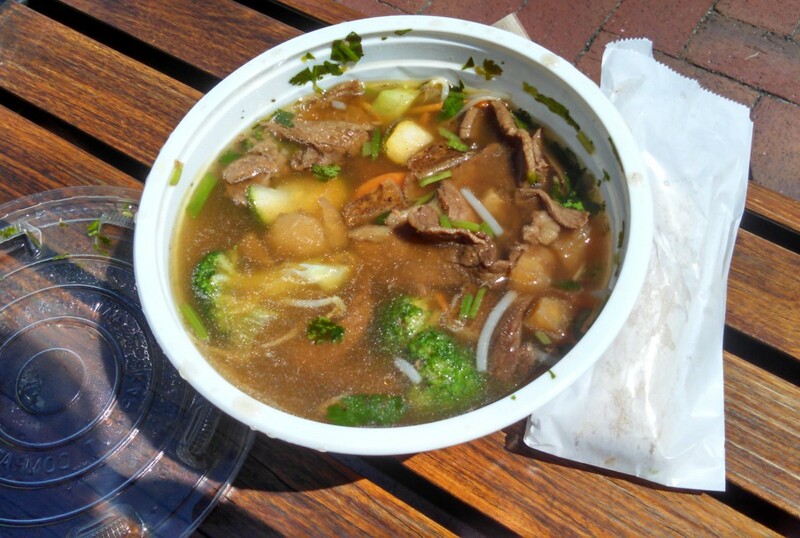 The ramen’s thin noodles were a bit too al dente for my taste and the beef was a little dry, but the broth was flavorful with wonderfully crisp vegetables. The portion was generous and I had some left over. The bowls and lids they use are sturdy and basically spill proof, so it was easy to bring back to work with me. When I went to Saté the following week, I decided to try the ramen again, but opted for tofu and got a dumpling instead of a crispy roll on the side. The noodles were more to my liking and the tofu was a better fit with the rest of the ingredients. My friend got a rice bowl with Korean BBQ chicken, which she enjoyed thoroughly. I’m most impressed by the speed at both locations, as my meals were ready to take away by the time I finished paying. I don’t feel like this speed comes at the expense of quality. Neither location offers seating, as Momogoose is a truck and Saté is just a counter in a hallway, so they’d be good options if you need to grab something quickly to take back to the library. Momogoose. Congress St and JFK/Surface Rd, Boston, MA. Monday-Friday 10:30am-2:30pm | Saté. 89 South St, Boston, MA. 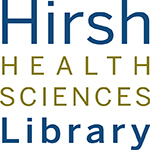 Monday-Friday 10:30am-2:30pm. Both locations accept cash and credit cards. Have you braved the food truck lines? Do you have a suggestion for the next place we should try? Write to us! For this month’s spotlight, I decided to broaden my horizons and go somewhere out of my normal lunch rotation. I chose Pita Kabob in Downtown Crossing, where I somehow have yet to eat, despite walking past it frequently for nearly a year. Conveniently located on the same block as the Chauncy Street exit of Downtown Crossing, it offers Persian food, as well as a handful of standard American deli options. It’s a great menu for vegetarians and meat-eaters alike. The interior is spartan, but the staff is welcoming. You order and pay at the cashier first, so you’re good to go on your way once your order is ready. For my first foray into their menu, I decided to try the falafel pita wrap ($5.85). I’m no falafel connoisseur—in fact, I don’t actually like falafel all that much and always seem to forget that—but I really enjoyed it. It’s baked instead of fried, so wasn’t crispy like it often is, but still had a nice texture and flavor. The toppings were what made it excellent, though. The tahini and hot sauce were delicious and the lettuce and tomato, oft-neglected wrap elements, were impressively fresh. I definitely want to go back to try some of their other offerings. They have nine different options for pita fillings, most of which can also be ordered on a salad, or served as a platter with Basmati rice and hummus or salad (shirazi, garden, or yogurt). The price for a pita wrap depends on the filling, and ranges from $5.25 for hummus to $8.55 for salmon kabob. Most of their other items fall within that range as well. They also serve breakfast and all their breakfast sandwiches are under $3.00—it’d be a convenient stop for Red Line riders on their way to campus in the morning. I can’t offer much insight into their speed at busy times, as I was the only customer in line and enjoyed a leisurely conversation with the owner as he prepared my order, but their setup looks like one that could handle a high volume of customers with ease. There’s some counter seating inside, but it’d also be an easy walk over to the Common, Post Office Square, or the Greenway, where I decided to take mine. Nota bene: Be sure to grab a bunch of napkins! Although the wrap was well-constructed, I couldn’t simultaneously eat and read without adorning my magazine with hot sauce and tahini. You may not want to eat it at your laptop. Pita Kabob. 2 Lafayette Ave, Boston, MA (entrance on Chauncy St) Monday-Friday 7:30am-5pm. Accepts cash and credit cards with a $15 minimum. What do you think of the baked falafel? Have you tried their breakfast? Do you have a suggestion for the next place we should try? Write to us! 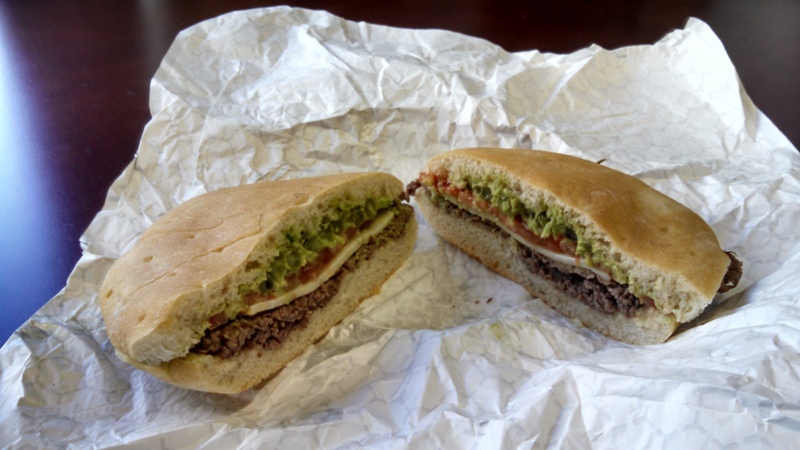 This month, our Under10 Spotlight is Chacarero, a popular lunch spot on the edge of the Financial District. The walk is a straight(ish) shot from campus down Harrison and Chauncy to 101 Arch Street—about 8 minutes, give or take. 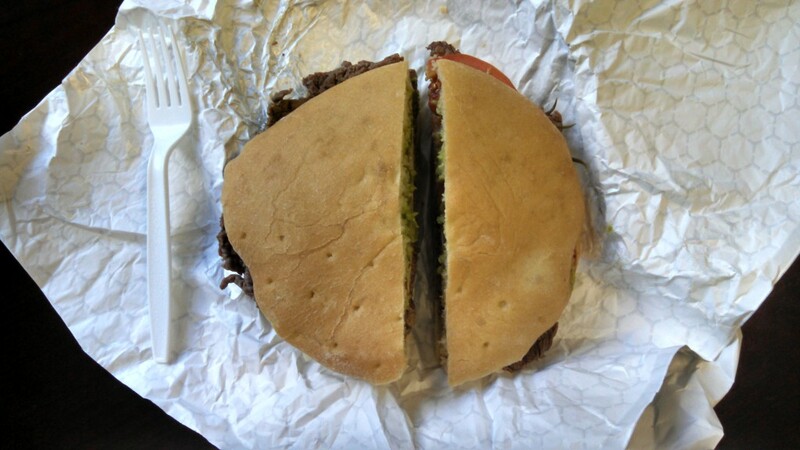 Chacarero’s signature item is…the chacarero, a classic Chilean sandwich. My favorite part is the bread, which is baked fresh daily. It’s round, sort of flat, and manages to both dense and light at the same time. For the main ingredient, you have a choice of plain or bbq grilled beef or chicken (or both), or grilled vegetables. It’s topped with tomatoes, muenster cheese, avocado spread, green beans, and their secret hot sauce. You can also add a super spicy hot sauce that I wasn’t brave enough to try, but hear is very good. A small sandwich ($6.35-$8.95) is the perfect size for lunch, but they also make a large size ($7.45-$10.00). They offer assorted sides, desserts, and beverages, as well as a number of breakfast items. The lunch rush is tackled with an impressive display of assembly-line sandwich making. The line was out the door when I arrived at 12:45pm, but it took only five minutes to get up to the cashier, where I ordered and paid. I was outside with my meal in less than four minutes after that. Other times when I’ve gone later in the afternoon, there’s been no wait, so I’d recommend going closer to 2pm if you’re short on time. There’s a decent amount of seating in the air-conditioned restaurant but one of my favorite spots to eat in the area is not far away. If you have time, continue on Arch St and take a right down Franklin St for about two blocks to Post Office Square. You can enjoy your sandwich on the lawn in the park—be sure to grab a free cushion from one of the bins to protect your clothes from the grass! Chacarero. 101 Arch St, Boston, MA. Mon-Fri 8am-6pm. They accept cash, Visa, Mastercard, and Discover. Have you braved the super spicy sauce at Chacarero? Do you have a suggestion for the next place we should try? Write to us! 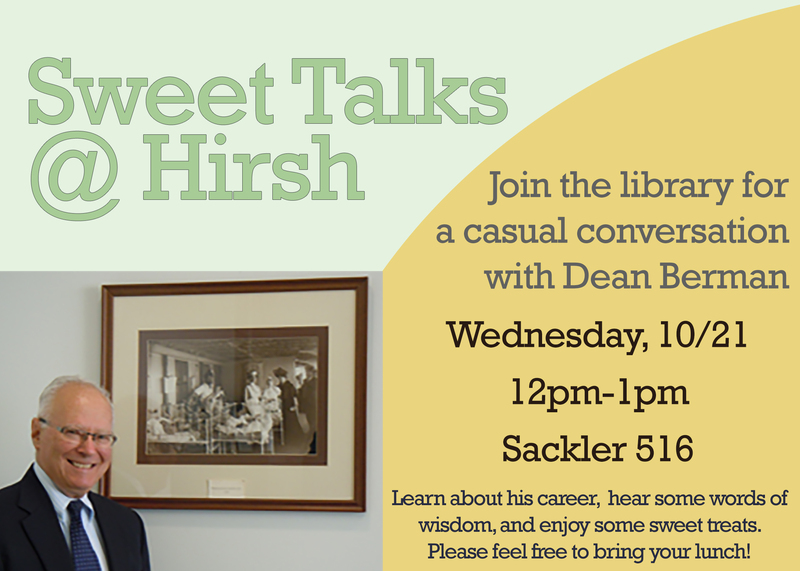 We’re lucky that campus is so close to so many great dining establishments, but lunch choices can become routine. It’s no easy feat to choose from such a wide range of options when you have limited time and a limited budget. In this series of blog posts, we’ll highlight lunch spots where you can get lunch for under 10 dollars in under 10 minutes(ish). Is there a place you’ve always wanted to try but haven’t had the chance to yet? Let us know and we’ll check it out for you! 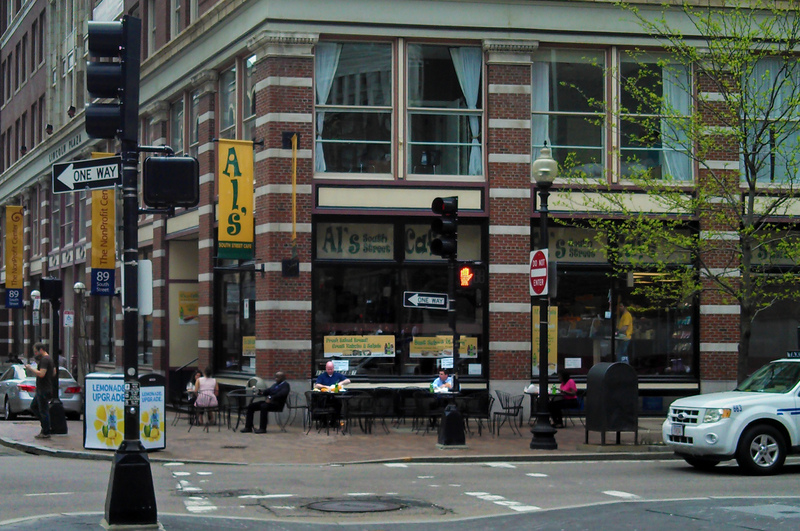 Al’s South Street Café is right around the corner from South Station and is a sure bet for a quick and delicious sub. Walking in for the first time during the lunchtime rush can be a bit daunting, as it is packed with regulars who clearly know what they want and where to stand to get it. To maximize efficiency, there are two lines–one to the right for cold subs and one to the left for hot. I’d recommend standing back to study the menu before jumping in line, as it moves fast (really fast!) and the staff, while pleasant, are committed to speed and will start making your order the moment you appear in front of them. I am always impressed at how quickly they assemble the cold subs. Hot subs take a bit longer, naturally, but really don’t require a much longer wait. A small sub, measuring in at 10 inches, is more than enough for lunch, and at $6.50 is a great value. For $8.00 you can get any small sub or wrap, a 20oz soda, and a bag of chips. If you’re feeling hungry (or want leftovers for later), you can pick up a large sub for $8.50. My favorites are the Al’s Café Special (prosciutto, fresh mozzarella, plum tomatoes, basil, olive oil, and balsamic vinegar) and the chicken salad (“Best Chicken Salad in Boston” according to their menu). Being somewhat of a creature of habit, I must confess that I have yet to try any of the hot subs, but a friend and fellow Al’s-devotee recommends the Chicken Arianna (grilled chicken tenders, melted cheese, lettuce, tomatoes, and buffalo blue cheese) or the Chicken Pesto (chicken tenders with—you guessed it—pesto). They also offer a selection of salads (standard sub shop varieties like Greek, Caesar, etc) and soups. Some seating is available inside, but you ought to get away from the noise and sit outside in Dewey Square or by the Chinatown Gate if the weather’s nice. And of course you can always bring it back to the library to resume your studies and make everyone jealous of your delicious lunch. Do you have a favorite sandwich at Al’s? Do you have a suggestion for the next place we should try? Write to us! Al’s South Street Café. 179 Essex St. Boston, MA 02111. Mon-Fri 10:30am-3pm. They accept cash, credit cards, and LevelUp.